Maiko Yoshizawa was born in Chiba Japan. After graduating Joshibi University of Art and Design Junior College, she transferred to Tama Art university BFA in Japanese Paintings as junior and finished MFA in 2012. 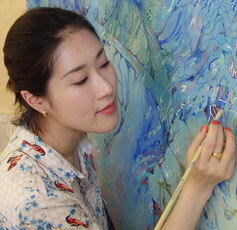 Her specialty is Japanese paintings using mineral pigments on Japanese papers. Currently, she is putting exhibition around Tokyo and also making a lot of effort to create “new collaboration” such as the stage of body painting and dance performance. 2013 "13th Sato Taisei Prize Art Exhibition in Fukuchiyama"
2014 "1st Terrada Art Award"
2015 "ART AWARD NEXT Ⅲ"
2017 "7th Triennale Toyohashi, Hosinoshingo Award"
2017 "Stage Drama,Aomorikenn no Semushiotoko,Body painting"
"Stage Drama,Ooyama Debuko no Hanzai,Body painting"
Working on the theme of reproduction of self and carnality. An act of fulfilling narcissism is sensual and involves the act of gathering things that are lacking. For me, these acts are very close to a strong desire to create. Time and time again, I have faced an unacceptable reality in daily life. This type of reality comes about due to changes in thoughts and feelings with the passage of time: joy and sorrow, relief and irritation, reconciliation and contradiction, etc. I therefore am aiming to rebuild my collapsed identity. In order to do this, I’m discussing the things I am missing within myself and am seized with the passion to recreate myself. This process is fraught with a kind of game-like quality for me, and promotes sensuality. And so I have the motivation to share these senses with others.By the act of reproduction in relation to reality, I produce works.